The growing number of elderly people is a large consumer of home care drug delivery devices. The global aging population is set to increase from 784 million in 2011 to 2 billion by 2050 and 2.8 billion by 2100. An increase in the number of geriatric patients and a rise in demand for convenient drug delivery options pose major opportunities for the development of innovative and easy-to-use drug delivery systems. Add to that the fact that, according to EvaluatePharma, a pharmaceutical researcher, patent expirations between 2012 and 2018 will result in an estimated $290 billion loss in sales of branded products. These patent losses coupled with faltering pipelines are causing pharmaceutical companies to reposition currently marketed drugs through reformulation using novel drug delivery technologies. These factors are giving rise to a new generation of transdermal, topical, and subcutaneous drug products designed to satisfy caregiver and patient preferences while addressing managed care initiatives and the formulation limitations of new classes of therapeutic drugs. Because of their ability to safely and reliably satisfy treatment protocols and compliance goals, non-oral drug delivery products will have a significant impact on the future of drug selfadministration. Thus, according to recent news reports, analysts are predicting that the transdermal delivery market could be worth as much as $31.5 billion by 2015 from a value of $21.5 billion just three years ago. “The growing interest in transdermal, topical, and subcutaneous drug delivery is a reflection of the industry’s quest for alternative routes of administration, much needed for the delivery of new chemical entities (biologics in particular) as well as for enabling and enhancing the drug pipelines for known compounds that stand to benefit from reformulation,” says Jasmine Musakhanian, Marketing & Scientific Director, Pharmaceutical Division, Gattefossé USA. 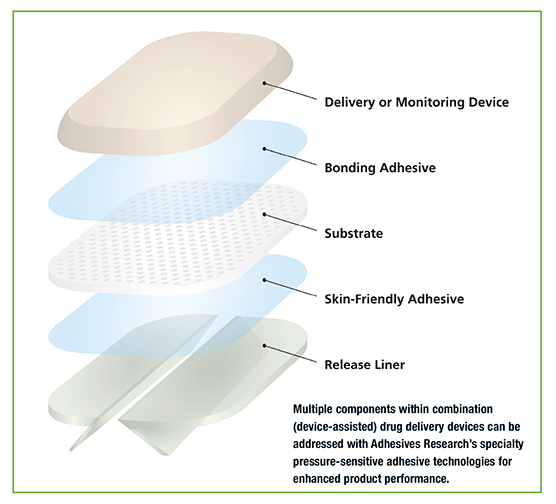 Adhesives Research (AR) is a custom developer and manufacturer of specialized pressure-sensitive adhesives (PSAs) and coatings that address the material challenges of body-worn drug delivery devices. These devices typically require an adhesive to mount a needle or patch component securely to the skin for wear times from under an hour up to 7+ days, depending on the drug therapy. The adhesive must be able to carry the weight of the device, yet remain comfortable without damaging patient skin during wear or upon removal, explains Susan Newsom, Pharmaceutical Business Manager. “We are noticing an increased interest for enabling adhesive technologies in combination products (device-assisted drug delivery) such as patch-pump applications,” says Ms. Newsom. Developers of body-worn devices are seeking adhesives that securely bond to a wide range of patient skin types and patient activity levels while remaining comfortable during wear and upon removal. Developers are also building their devices from flexible, specialty elastomeric materials to improve patient comfort during wear. These low-surface energy elastomers present their own bonding challenges. AR is addressing the growing need for specialty skin-friendly adhesives while overcoming the thickness issues of gel formats and limitations of current commercially available acrylic adhesives through the development of a low-trauma adhesive (LTA) platform technology for gentle removal. This high-moisture vapor transmission rate (MVTR), customizable PSA technology maintains reliable, intimate skin contact for up to three days and can be removed and reapplied without the adhesive bonding to itself. The LTA formulation has high, immediate tack to skin upon application, yet removes cleanly without leaving any residue, and is biocompatible, non-cytotoxic, non-irritating or sensitizing. “The LTA technology exhibits good-toexcellent ratings for resistance to gamma sterilization, unlike silicones, which are often unable to withstand these sterilization techniques,” says Newsom. Adhesives Research is addressing the growing need for long-term wear (LTW), skin-friendly adhesives for body-worn drug delivery devices through a new adhesive technology. Its tailorable LTW adhesive platform meets the critical design parameters required for adhesives in applications requiring a more aggressive adhesive to secure a load-bearing device in place for up to seven days. This new technology offers high moisture vapor transmission rates (MVTR) for breathability, good wear properties, minimal edge-lift, and tolerable removal with no adhesive residue remaining on skin. AR also offers a conformable, medicalgrade PSA tape technology for bonding low surface energy (LSE) materials such as TPE (thermoplastic elastomers) without a secondary curing step for increased manufacturing ease and efficiency. The adhesives are non-cytotoxic and can be provided in transfer, single-sided or as a double-sided tape configuration with a skinfriendly adhesive on the opposite side. AR’s family of adhesives for LSE bonding include acrylic, hybrid, and silicone chemistries formulated for immediate and permanent bonds with minimal pressure. Transdermal delivery of large molecules is a major emerging opportunity. Worldwide sales of biologics are expected to grow to $87 billion by 2014, and an estimated 50% of all future approvals are expected to be biologics. 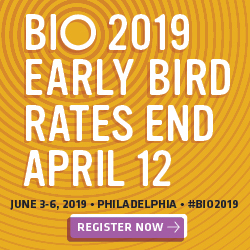 The market is embracing biologics and nextgeneration molecules that mimic the actions of biologics, and the demand is increasing for advanced delivery systems for these molecules. Transdermal delivery of large molecules as an alternative to intramuscular, subcutaneous, or intravenous routes of administration can add significant patient benefits and improve the economics of treatments in the future–both in the developed and developing worlds. The active transdermal delivery of macromolecules using microneedle patch technologies is one of the major trends in addressing this market. Transdermal delivery of biologics is a new field, and Corium’s clinical-stage MicroCor® transdermal technology platform is designed for safe, effective, and convenient transdermal delivery of most types of biologics (peptides, proteins, nucleic acids) and vaccines. Corium has completed a Phase 1 clinical study and a number of preclinical evaluation programs with partners using this technology with peptides, proteins, vaccines, and small molecules. These programs are advancing to the next stages of development based on positive results. “In addition, using our Corplex™ technology and other passive transdermal technologies, Corium has developed and is commercializing with its partners several new transdermal and oral film products that have delivered on the promise of consumer acceptance and market success,” says Peter Staple, CEO. Corium has both passive and active delivery transdermal programs. The passive programs revolve around the Corplex platform for the delivery of small molecules, especially those molecules that are otherwise difficult to formulate. Corplex is a suite of technologies incorporating combinations of materials that utilize the properties of both traditional pressure sensitive adhesives (PSAs) as well as bioadhesives. Corium has the capability to apply this technology to develop products that can be made in liquid (sprays, film formers), semisolid (gel, creams and ointment-like) and solid (powder, particles, dry and wet films, and patches) forms. The platform is also applicable for transdermal delivery of small molecules where side effects, compliance, pill burden, or poor bioavailability are a concern. Some ideal candidates include hormone therapies, pain medications, and central nervous system diseases (e.g. Parkinson’s disease, Alzheimer’s disease, Schizophrenia, etc.). Corium’s MicroCor transdermal delivery system delivers drugs from an integrated transdermal system in a one-step process and is applicable to the delivery of peptides, therapeutic proteins, potent mAb’s and vaccines. “Delivery through the skin is an excellent means for rapid uptake of these molecules, and is also an ideal route of administration for eliciting a more efficient and robust immune response to an antigen compared to intramuscular injection,” says Mr. Staple. The system integrates drug molecules directly into arrays of solid-state biodegradable microneedles, which penetrate the outer layers of the skin to release the drug for local or systemic absorption. The microstructures can be fabricated from a variety of materials and in different lengths (200µm or longer), offering significant flexibility in the depth (stratum corneum to dermis) and duration of delivery (rapid to sustained administration). MicroCor systems are thermally stable, which provides unrestricted portability, and are biodegradable, which eliminates needlestick injuries, needle reuses, and medical waste disposal. This results in a more efficient, cost-effective approach to patient care, says Mr. Staple. Needle-free passage of drugs to and across the skin layers is a significant challenge. Formulation requires appropriate vehicles enabling solubilization and suspension of the active in the dose; facilitating passage of the active across the outermost layer and barrier function of the skin, the stratum corneum; permeation of the active in subsequent layers of the epidermis; and if the case may be, partitioning and diffusion of the active into the dermis thus reaching the systemic circulation. As a provider of excipients and formulation technologies, Gattefossé USA faces a growing demand for its topical excipients, notably solubilizers and penetration/permeation enhancers. Functionality, safety, and regulatory acceptance are among the top criteria in demand. 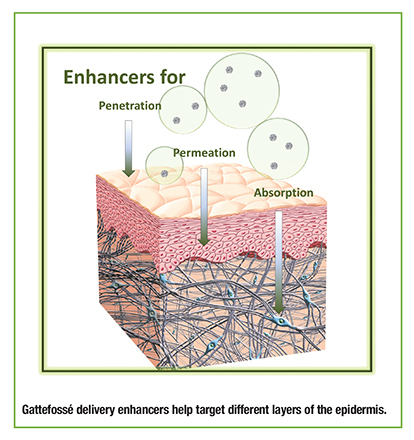 Gattefossé’s product offer crosses various drug delivery systems and includes solubilizers (Labrasol), penetration enhancers (Transcutol®), permeation enhancers (Labrafil®), and building blocks for nanoemulsions and solid lipid nano-carriers (SLN). Much like drugs, excipients take considerable time and years of research and development before they are introduced to the market. The development path at Gattefossé, from conception to industrialscale production batches, is long and involves clinical studies to establish safety and stability studies for up to five years after manufacture, explains Jasmine Musakhanian, Marketing & Scientific Director, Pharmaceutical Division, Gattefossé USA. Alongside the physico-chemical properties and the formulation, efficacy of the excipient must be characterized. The demand for proprietary pharmaceutical products continues to grow, however there is additional pressure in the topical space because there are limited new drug compounds in dermatology. Thus, the demand for delivery systems like Skinvisible’s patented technology Invisicare® to differentiate products is at the forefront of new product development. Invisicare can be tailored to any ingredient and consists of both hydrophilic and hydrophobic polymers that form a complex that is added during manufacturing. Skinvisible, a contract research and development company, targets pharmaceutical, consumer-goods, and cosmetic companies seeking patent protection. “We achieve this by licensing out our finished formulations on an exclusive basis or providing life cycle management for companies with products coming off patent by reformulating with Invisicare,” says Terry Howlett, President and CEO of Skinvisible. Invisicare provides an enhance delivery of ingredients, influencing how products act and their effect on the skin. It binds products to the skin and resists washoff or rub-off, it controls the release of active ingredients and, if desired, can increase the release of actives; sometimes 2 to 4 times the release of a branded product, states Mr. Howlett, which can decrease skin irritation. 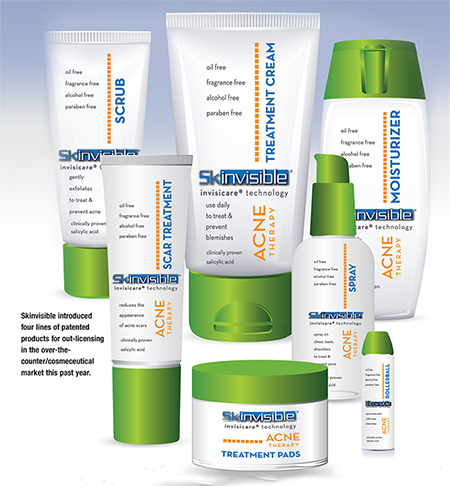 “Additionally Invisicare has a stabilizing effect on actives as illustrated by our two recent patents granted for stabilizin avobenzone in sunscreens and retinoic acid in acne formulations.” Skinvisible has seen increased demand for proprietary products in the over-thecounter and cosmeceutical marketplace as “me-too” products cannot meet market share expectations, explains Mr. Howlett. The company has introduced four lines of patented products available for exclusive out-licensing in the over-the-counter/ cosmeceutical market this past year, including acne therapy, foot and leg therapy, anti-aging, sun care and sunless tanning (which includes broad spectrum sunscreens that received a U.S. patent for stabilization of avobenzone for eight hours). “These product lines address the growing demand for proprietary products with distinctive consumer benefits that translate into messaging that resonates with consumers,” says Mr. Howlett. Driving market growth in transdermal and transmucosal drug delivery is consumers’ desire for discrete, single-dosing solutions that fit active lifestyles. When the drug delivery solution fits the consumer’s active lifestyle and offers the flexibility the consumer seeks, compliance increases and efficacy improves, says Patricia Kitchen, Vice President, Research & Development, Tapemark, a full-service contract development and manufacturing organization. A transdermal patch, for example, is convenient, user-friendly, and can be applied discretely. Because transdermal delivery works so well for the consumer while offering advantages such as bypassing firstpass metabolism and localized efficient drug delivery, the market will continue to grow. Additional market expansion is expected from generic competition for branded products reaching patent expiration. One area that is growing is that of active transdermal technology, such as iontophoresis, which delivers drugs via lowlevel electrical current through the skin’s pores. This can provide faster and more controlled drug delivery than passive transdermals, as well as the delivery of larger molecule drugs, says Ms. Kitchen. One example is IontoPatch® technology from Travanti Medical, a business unit of Tapemark, currently used in the physical therapy market. 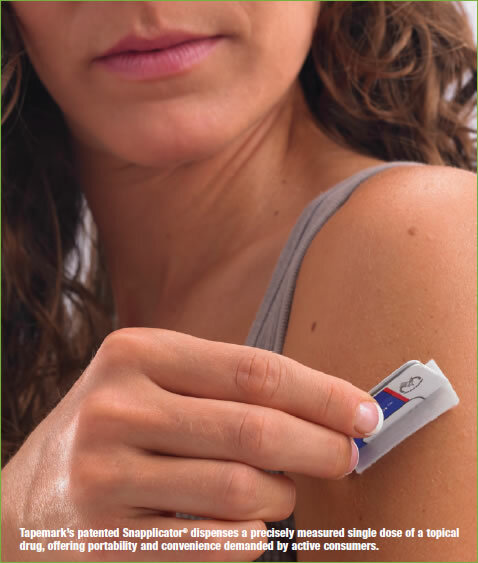 IontoPatch is an extended time-released electronic transdermal drug delivery system. A self-contained flex battery produces an electric current to carry drug molecules non-invasively across the skin and to underlying tissue. Tapemark is also active in the oral thin film market, which offers transmucosal delivery that fits the model of convenient, discrete, single-dosing solutions for active lifestyles. Oral thin films administer the contents via absorption in the mouth buccally or sublingually. This allows the contents to bypass the first-pass metabolism, making the product more bioavailable and providing more rapid onset of action. For transmucosal formats, Tapemark supports formulation, blending, and coating the oral thin film, in addition to converting and packaging in Tapemark’s SoluStrip™ format. Each dose of film is individually packaged in its own pouch, offering convenience and portability while enhancing compliance and safety, explains Ms. Kitchen. In the topical delivery market, Tapemark has had success with its patented Snap!® and SnapplicatorTM single-dose packaging formats. Again fitting the model of discrete single-dosing solutions, Snap! dispenses a precisely-measured dose of a variety of topicals, including gels, lotions, and ointments. Snapplicator adds an applicator for “no-touch” dispensing and application, a feature that lets the consumer apply the correct dose. This also avoids patient contact with the drug or the condition being treated, when desired, and can deliver a combination of two different semi-solids dispensed simultaneously. In the topical space, Tapemark offers single-use pads and topical patches created by coating or dispensing the active pharmaceutical ingredient onto a nonwoven material. Tapemark recently expanded capabilities and physical facilities to meet market needs for transdermal and transmucosal drug delivery, and is adding formulation, blending, and coating to its existing converting and packaging capabilities, with blending and coating expected to be online this fall. According to a 2010 IMS Health and Mintel Report, an estimated 74% of 65- to 69-year-olds in the United States are affected by at least one chronic condition, placing a burden on health care providers, patients, and caregivers, and emphasizing the importance for pharmaceutical companies to consider patient and caregiver-focused drug delivery technology. This is especially important because care that was once administered by an institution is now shifting to being administered in the patient’s home. Simultaneously, as the aging population continues to grow, many pharmaceutical companies are facing significant patent cliff. Many of today’s leading products are coming off patent in the next three to four years, prompting companies to seek new ways to protect their brands as long as possible. Reformulation to transdermal delivery offers a path for a pharmaceutical company to extend its branded product lifecycles. The benefits of using a transdermal patch to target the needs of the aging population can ultimately translate to a dosage form that is more patient and caregiver friendly. For instance, in caregiverintensiv settings, the transdermal patch offers important advantages, particularly for patients taking multiple medications. The ability for the patient to self-administer the patch, and the appeal patients may find in a decreased number of pills to swallow each day are factors that can contribute to increased compliance. Additionally, caregivers may also find value in the ability to visually confirm a secure placement of the patch, which is much easier than confirming that a pill has been swallowed. With regard to the patent cliff, transdermal delivery can offer a number of competitive advantages for pharmaceutical companies. 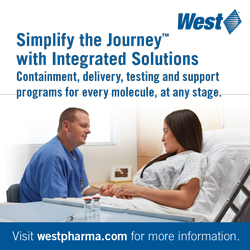 “For example, a pharmaceutical company that focuses on lifecycle management earlier and includes transdermal delivery as a parallel path during development could obtain a better position to extend the life of the drug, and strategically introduce a variety of formulations to drive patient preference,” says Jordan Fineberg, Global Transdermal Business Manager at 3M Drug Delivery Systems. 3M Drug Delivery Systems has pioneered advancements in passive transdermal delivery including the first 7-day stand-alone drug-in-adhesive transdermal patch, and offers transdermal solutions at any product development or manufacturing stage, Mr. Fineberg points out. “Transdermal drug delivery has the potential to offer improved safety and efficacy by avoiding first-pass metabolism and maintaining more constant drug levels, versus the peak and trough effect seen with oral delivery,” explains Mr. Fineberg. Passive transdermal systems allow a drug to diffuse through the skin at the targeted therapeutic dose range where it can act locally or penetrate the capillaries for systemic effect. Passive systems are most useful in delivering small-molecule drugs because of the barrier properties of the skin. Additionally, transdermal devices can deliver multi-day dosing at a specific pharmacokinetic profile, which is a distinguishing factor for the drug delivery method. Another key aspect of transdermal delivery is its ability to deliver more than one drug in a single patch, which adds additional convenience for patients. “Looking into the future, the aging population will continue to grow. We see a trend of caregiver-intensive and chronic care indications placing pressure on pharmaceutical companies to provide delivery devices that offer convenience to the patient and potential for increased compliance. This demand will drive the industry to explore and develop patientcentric delivery forms, and may fuel the next wave of transdermal products,” says Mr. Fineberg. Pharmaceutical companies are looking to reposition currently marketed products and grow pipelines, presenting a significant opportunity for drug delivery companies. 4P Therapeutics is taking advantage of this market trend by providing partners with transdermal drug delivery technologies. 4P Therapeutics has expertise in developing novel transdermal drug delivery products using multiple transdermal technologies and leveraging a fully integrated developmen infrastructure. Its primary focus is on developing transdermal products for currently injected or infused compounds. These include compounds on the market or in development. The company also develops conventional transdermal systems and has found that pharma companies are combining drug delivery technologies with their NCEs in development. In the last year, 4P Therapeutics has entered into multiple partnerships with companies ranging from a global healthcare conglomerate to small biotech companies and an academic institution. An example would include its partnership with Medicure International, Inc., a specialty pharmaceutical company in Canada, whereby Medicure is focused on developing a transdermal patch for Aggrastat® (tirofiba HCl), Medicure’s lead product currently marketed as an IV formulation for the treatment of acute coronary syndromes, explains Steve Damon, President and CEO, 4P Therapeutics. 4P Therapeutics initially partnered with Medicure to demonstrate the pre-clinical feasibility of delivering tirofiba transdermally as an alternative to its current IV delivery. After successfully completing the initial feasibility studies, 4P Therapeutics and Medicure entered into a product development and commercialization partnership. This approach allowed Medicure to assess the pre-clinical feasibility of delivering tirofiban transdermally and offered the flexibility to generate valuable data before entering into a broader partnership with 4P Therapeutics and committing additional resources to the project. To date, 4P Therapeutics and Medicure have demonstrated in vivo proof-of-principle for transdermal tirofiban. The development program is now focusing on refining the transdermal tirofiban formulation in preparation for initial human studies. 4P Therapeutics’ approach to partnering for the development of new transdermal products revolves around a model to assess feasibility. The model establishes pre-clinica feasibility followed by proof-of-concept in human clinical trials. “Once the feasibility has been established and considerable risk has been mitigated, 4P therapeutics and our partner can then choose to enter into a broader agreement for developing products,” says Mr. Damon. The company’s feasibility model consists of efficient in vitro and in viv screening to determine the feasibility of delivering a compound in pre-clinical and Phase 1 clinical studies. As an initial step, 4P Therapeutics’ team can determine the feasibility of delivering a compound through the evaluation of the compound’s physica characteristics and delivery requirements. The 4P Therapeutics’ team selects the technology that presents the best probability for development success before moving into in vitro testing. Then, feasibility testing in pre-clinical models is performed. The company’s integrated capabilities include in-house, pre-clinical development, including bioanalysis, CMC development, IND preparation, and strategy for combination products. Its Atlanta-based facility is equipped with a vivarium for preclinical testing, an in-house Phase 1 unit for clinical development, manufacturing facilities for process development and earlystage clinical manufacturing. In the area of transdermal microneedle drug delivery, Zosano is observing significant clinical data points that validate that intradermal drug delivery using a microneedle patch can match efficacy and safety of subcutaneous injectables with increased compliance, convenience, roomtemperature stability, and usability, states Peter Daddona, PhD, Chief Scientific Officer, Zosano. The Zosano transdermal microneedle technology delivers drugs into the skin for rapid dissolution and absorption by skin capillaries. This passive delivery method provides rapid onset without the pain or challenges of injectable products, Mr. Daddona explains. “The microneedles are long enough to produce desired pharmacokinetic profile and meaningful efficacy, but they are short enough so that they don’t interfere with the nerve endings and therefore cause virtually no pain,” he says. Because the microneedles protrude only into the skin epidermal and dermal skin layers and not the subcutaneous fat (like hypodermic needles) there is less patient-topatient absorption variability. Zosano’s technology has demonstrated consistent delivery and similar consistency vs. an injectable product. The dry, drugcoated microneedle patch and packaging provides room-temperature stability data on the company’s lead product, PTH (> three years), and Zosano expects to have this advantage in future products as well. Zosano’s Phase 2 results for daily administration of PTH illustrated this, showing comparable improvement in spine BMD vs. Forteo® and better improvement in hip BMD vs. Forteo. Zosano achieved faster Tmax than the injection and lower incidence of hypercalcemia. Moreover, as part of the Phase 2 study, Zosano completed a patient acceptability study and received extremely strong responses in all areas, but particularly with regards to ease of administration, self-application, skin tolerability, and general usability, explains Mr. Daddona. 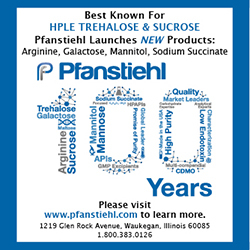 Zosano plans to initiate a PTH Phase 3 study in 2014. As validation of this perspective, Zosano has seen increased interest from investors and pharma partners. Zosano signed a licensing deal with Asahi Kasei in 2011 with $33 million in upfront and milestones for PTH in Japan, China, Korea, and Taiwan. Zosano has carefully selected target markets where its products will serve the highest unmet medical need. The severe osteoporosis market presents such an opportunity with a currently marketed product (Forteo) that is a daily injection for two years of treatment, requires refrigeration, and also necessitates a fastonset of action to reduce fracture incidence. Zosano not only produces a faster onset compared to Forteo, but also does not require refrigeration and possesses the clear patient usability advantages of a patch application compared to a hypodermic needle injection, states Mr. Daddona. The second target market where Zosano expects to introduce its technology is in severe hypoglycemia caused by insulin overdose. The current product for severe hypoglycemia is a glucagon rescue kit, which is provided as a sub-optimal and kluge needle-injection system that is a very challenging to use, requires a multi-step reconstitution, possesses an unstable formulation, and a limited shelf-life, explains Mr. Daddona. “The core competencies and advantages of Zosano’s microneedle technology directly fill the voids in this market,” he says.